During the 60-minute presentation, Google co-founder Sergey Brin said he found the election "deeply offensive". Breitbart said the video showed evidence of Google's inherent bias against Republicans. Google defended itself by saying the executives had been expressing their "personal views" and it had no political bias. In its story, Breitbart said the video had reached it via an anonymous source and showed the "panic and dismay" within Google following Mr Trump's victory. In addition, US Attorney General Jeff Sessions had expressed "concern" about the way social media companies handled debate on their sites. 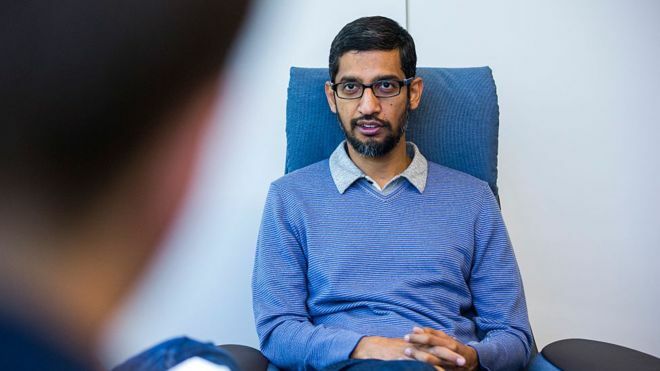 In the video of the "all-hands" session, co-founders Sergey Brin and Larry Page, chief executive Sundar Pichai, and executives Kent Walker, Ruth Porat and Eileen Noughton are all seen giving their reactions. Mr Brin says: "As an immigrant and a refugee, I certainly find this election deeply offensive and I know many of you do too." The "stressful times" are at odds with many of Google's core beliefs, he says. "So many people apparently don't share the values that we have." In a statement on Thursday, Google said the comments had been made "in the aftermath of a long and divisive election season". "Nothing was said at that meeting, or any other meeting, to suggest that any political bias ever influences the way we build or operate our products. "To the contrary, our products are built for everyone and we design them with extraordinary care to be a trustworthy source of information for everyone, without regard to political viewpoint."